Welcome to 4S Dance Academy! 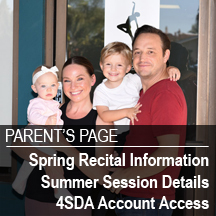 4S Dance Academy believes a strong understanding in ballet technique is the foundation for all forms of dance. All students receive personal, hands on, high quality training. Though we are a ballet based school, we offer and encourage all forms of dance in a nurturing and enthusiastic environment.